We have dealt with many post-Christmas party issues over the years. Most of them were difficult and expensive to resolve (and some just mind-boggling). Despite the fact you are off-site and outside working hours, your staff are still ‘acting in the course of their employment’ by attending. This means you are liable for their actions and behaviour, and could find yourself in a disciplinary situation with an employee acting inappropriately, or facing claims from other employees about unacceptable behaviour. Be mindful when choosing the venue or a theme. 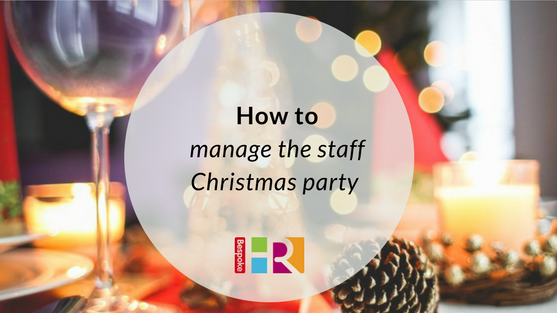 Not everyone likes a Christmas party, and some employees can find it stressful. If you know a team member is struggling, or will feel uncomfortable, it’s worth considering an alternative – such as a lunch. Take care not to offend any staff with the choice of theme or venue on religious or moral grounds. Having policies in place which clearly describe the type of behaviour or conduct that is expected in the workplace are essential to protect your staff and business. These should refer to your grievance or complaints policy which sets out how you will manage any issues, should they arise. Work with line managers to ensure these policies are clearly understood by your team members. You could even use recent news stories as a prompt to remind staff of the expected conduct at parties and other social events, and that what may be considered light-hearted fun by one colleague could be construed as unwanted attention or harassment by another. A simple email before the party to remind staff of conduct is an effective way to reinforce this message. Does your company have a social media policy? If not, it may be an idea to draft one to protect your business. Drunken or inappropriate pictures on Facebook could have a damaging impact on your brand. Consider whether it’s appropriate for staff to share pictures on social media, and create guidelines around what is acceptable in relation to your business. It’s in everyone’s interests to have a fun but safe evening. One way to minimise risk is to control the alcohol you provide – run a free bar for a limited period, then convert to a cash bar at a specific point during the evening. Organising transport home for your staff at the end of the night is always appreciated, and makes sure that everyone arrives home safely. It is a nice perk for employees to know that their transport has been paid for and the company cares about them.